In arguably, a house is one of the most important purchases someone makes in their life. It’s more than just walls and windows with a roof over it — when you buy your house, you’re buying your home. But while some people spend hundreds, even thousands of dollars on design and decoration, people often focus less on protecting their home. Unfortunately, one of the most neglected places in this regard is the attic. While it’s great for storing unwanted clothes, family photographs and things that never sell at garage sales, the attic is a lot more important than we give it credit for. So, now the question arises: What are some things that you can do to improve your attic? Conveniently, there’s an easy answer to this one: ventilation. While it may seem odd to ventilate your attic when it already has insulation, when you understand the science behind it, it’s easy to see how attic ventilation actually benefits you! By allowing cold air to ventilate through your attic, you’re keeping the warm air where you need it and the cold air near your roof, which serves as a great way to protect your shingles. So how do you keep your attic well-ventilated? There are there three things you can do: install gable vents; add ventilation holes to existing wooden soffits; and replace existing soffits with new, vented soffits. Installing gable vents is beneficial both during summer and throughout winter. When the temperatures rise, gable vents help aerate the attic at low cost and maintenance. And although it may seem illogical to keep the gables open during winter, the colder air actually helps prevent pernicious ice damming. 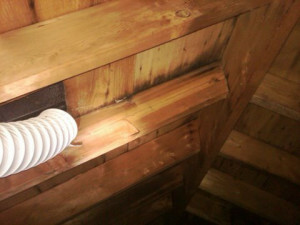 Another thing you can do to improve attic ventilation is add ventilation holes to your existing soffits. This process is simple and pretty self-explanatory, but if you’d prefer a guide, there are plenty on the Internet. Plus, this can turn into a fun project you can just do whenever you feel like fixing up the house a little bit. Also, be sure to keep in mind that replacing existing soffits with new soffits is also a must-do once the wood begins to rot. Through these three techniques, you can easily revamp your attic and improve its ventilation, in turn improving your entire house. Adding gable vents, putting ventilation holes in wooden soffits, and replacing old soffits all serve to increase airflow and keep the house in balance. Additionally, attic ventilation is important because it serves to keep heat down in the attic, which prolongs shingle life, reduces energy loss, prevents wood rot and keeps the overall health of your house in check. When it comes to small things making a big difference, these are three very minor fixes that can have major benefits for your home. Although sometimes it may seem like a hassle, in the long run, carrying out these three tweaks can not only save you money, but they’ll also improve the overall comfort of your home. Just think about it: Installing gable vents is a lot easier and cheaper task than repairing your roof as a result of an overheated attic. And what about those unbelievably hot summers? A well-ventilated attic helps control the heat in the attic and in your home, in turn helping you reduce your reliance on the air conditioner and ultimately leading to a smaller utility bill. But remember — ventilation is just as important in the winter, since it helps with moisture control. Eventually, because warm air naturally holds more moisture than cold air, the built-up condensation in your attic can cause wood rotting, mildew, paint damages and more. All in all, it’s important to note that attic ventilation is crucial to the health of your home, while still being simple and cheap to carry out. Gable vents, ventilation holes in your soffits and the replacement of old soffits are all things that will make you and your home much happier. Written by the staff at G.P. Construction Services where they specialize in garage door installation in Columbia, MO.